There are a number of very interesting conferences, seminars, and lectures listed in the Newsletter, so it is not possible to name them all. I have already mentioned the EAEPE conference and there are the Rethinking Marxism events, New Deal for the 21st century conference, and the Cachan-Amsterdam History of Economics as History of Science Workshop. There is also an interesting paper by Jamie Galbraith on the collapse of monetarism, the web site of the Japanese Post Keynesian Group, and a note on the award of the first John Kenneth Galbraith Prize in economics to Mel Watkins and Kari Polanyi Levitt. Producing the Newsletter is not a costless activity. For example, the work is needed to improve the presentation and the coverage of the Newsletter. Up to now I have not had the financial resources to do this. But this month, I am receiving a 15,000 euro grant from the Charles Leopold Mayer Foundation for the Progress of Humankind (FPH)( www.fph.ch ) to be used to improve the Newsletter and its distribution and impact. In return, I have agreed to produce book and article reviews on the following themes: rethinking trade regimes, rethinking the regulation of goods and services, the role of currency and finance, and diversity of economic approaches—further information about the themes and the reviews is attached. Over the next few weeks a preliminary list of articles, books, book chapters, theses, dissertations, government reports and other material will be compiled with consultation of heterodox economists who will be given a modest honorarium for their work. Given the list, reviewers will be solicited and perhaps in some cases honorariums paid (but this part has not been completely worked out yet). If you are interested in contributing to and reviewing material for the Newsletter-FPH project, please contact me by e-mail( leefs@umkc.edu ). - Financial Markets Meltdown: What Can We Learn from Minsky? The main theme is "Marxism and Sustainable Development"
In order to harmonise with the deadlines of the Call for Paper by the Research Area Coordinators, we have extended the deadline for the EAEPE Annual Conference 2008, "LABOUR, INSTITUTIONS AND GROWTH IN A GLOBAL KNOWLEDGE BASED ECONOMY" to 30th April 2008. All the submitted abstracts will be refereed by the scientific committee. Negri, Gayatri Chakravorty Spivak & Benjamin Baer, Susan Jahoda & Jesal Kapadia. some of the ideas and issues shaping both the emergence and trajectory of the journal. Routledge and Rethinking Marxism will also sponsor a 20th anniversary reception at the conference. Wolff, Maliha Safri, and Joseph Childers. "Materialism and Emperiocriticism: Lenin, Bogdanov and the fight for a distinct Bolshevik philosophy"
between Lenin and Bogdanov in 1908. A reception will follow both lectures to facilitate more informal discussion. Though admission to the lectures is free, advanced booking is required. Writing About the Dollar: Economic Expertise in the New York Times and Wall Street Journal in 1971-74 on May 13, 2008 at the Ecole Normale Supérieure de Cachan (France) is part of the H2S seminar program on History, Economics, and the Economy. "Les réformes des universités européennes "
(C.Charle (U.Paris 1), T.Chevaillier (U.Bourgogne ) , C Dutertre (U.Paris 7), T Lamarche (U.Lille), ..
report on the latest figures and recent trends on Tuesday 6 May. by Government tax and benefit policies. briefing will start at 10:30am and is expected to conclude by 12.30pm. Places at this briefing are free of charge and will be allocated on a first-come first-served basis. report, and this will be available from the morning on Friday 2 May. as actions of this agency, and hence as authentic expressions of the sovereign authority of the state. prevalent view that we may now be moving into a 'post sovereignty' era beyond the state. most influential books published since the second world war. headquarters in Carlton House Terrace in 1998. Please visit our website for full details of our forthcoming events. members of the audience are invited. que des outils nécessaire au travail scientifique sur leurs écrits (index des concepts, etc). l’Université de Bourgogne et la Fondation Gabriel Péri. • Robert Hue, président de la fondation Gabriel Péri, sénateur. The 3rd European Association of Evolutionary Political Economy symposium, Markets as Institutions: History and Theory, is to be held on September 5 and 6, 2008 in collaboration with the Economic Policy Laboratory of Athens University of Economics and Business. Clone Towns? The High Street in Historical Perspective on September 10 and 11, 2008 at the University of Wolverhampton, UK is a Centre for the History of Retailing and Distribution conference exploring the changing nature of the high street from the medieval to the contemporary period in Britain and elsewhere. A number of sessions at the Economic History Association Meetings in New Haven, Connecticut on September 12-14, 2008 are devoted to the theme "The Engines of Growth: Innovation, Creative Destruction, and Human Capital Accumulation" but papers on all subjects in economic history are welcome. A European Graduate School for Training in Economic and Social Historical Research advanced seminar at the University of Swansea, UK on September 17-20, 2008 seeks to bring together students from different backgrounds to discuss Industrial History, Industrial Culture: Representations Past, Present, Future and related issues. As income and wealth inequality approach levels not seen since the dawn of the Great Depression, we invite you to participate in a one- day conference on April 9: A New Deal for the 21st Century. Our partners at the Roosevelt Institution are marking the 75th anniversary of the New Deal by exploring policy ideas that will make up a new social contract for future generations, and EPI is honored to be among the event's co-sponsors. The lineup of speakers is impressive and includes our President, Dr. Lawrence Mishel. Best of all, registration is free! Join us on April 9 and spread the word to all who would be interested. Following the conference, the Franklin and Eleanor Roosevelt Institute presents the FDR Distinguished Public Service Award to Speaker of the House Nancy Pelosi and Senate Majority Leader Harry Reid at a gala dinner. Contact: Marianne Sherow, msherow@feri.org. Le sujet "la délibération au sein des conseils de politique monétaire des banques centrales indépendantes" et cette journée entrent dans le cadre d'un financement obtenu de la région Aquitaine dans le cadre d'un programme de recherches (2006-2009) regroupant les différents centre de recherches de Sciences Po Bordeaux sur le thème des "nouveaux lieux de gouvernance et de délibération". Elle servira également à présenter le nouvel ouvrage "Les banques centrales doivent-elles être indépendantes?" que j'ai co-écrit avec Philippe Moutot, directeur de la politique monétaire à la BCE, et qui vient juste de paraître aux éditions Prométhée dans la collection Pour ou Contre. 10 H - 11H Faucons versus colombes au conseil de politique monétaire de la Banque d’Angleterre ? Program and registration information is available at www.levy.org. of cultural and media activities. The UvA is a member of the League of European Research Universities. graduate (MSc) level. The teaching task will include supervision of BSc and MSc theses. internationally leading groups in this field. to present one of their papers at a seminar. research profile of the History and Methodology group can be found at http://www.fee.uva.nl/hme/. School of Economics, please visit www.ase.uva.nl. of two years, with possible extension for a two year period. Amsterdam offers a very attractive pension scheme. also be emailed to: applications-feb@uva.nl. Please include the job reference code. The closing date for applications is 30 April 2008.
macroeconomics, econometrics or development economics. responsibilities such as course coordination duties and participation in relevant committees. School’s academic programs and to developing a coherent and high quality research program. continuing appointment at Academic level B or Academic level C.
Professor John Foster, telephone (+617) 33656780 or email m.cowan@economics.uq.edu.au. Applications close: 30 May 2008.
a statement addressing how each of the selection criteria has been met must also be included. candidates’ areas of specialization at the undergraduate and graduate levels and economic principles. Bluffstone, Chair, Dept. of Economics, Portland State University, P.O. Box 751, Portland, OR 97207-0751.
salary commensurate with qualifications and experience. Includes and excellent benefits package. University, P.O. Box 751, Portland, OR 97207-0751.
within the Department of Economics and International Development. Department of Economics and International Development, Dr James Copestake at J.Copestake@bath.ac.uk or on +44(0) 1225 383859. Application forms and further details may be obtained from the Human Resources Department, University of Bath, Claverton Down, Bath BA2 7AY, email jobs@bath.ac.uk or contact +44 (0)1225 386873 quoting Ref No 08H110A. See www.bath.ac.uk/jobs. According to Minsky, government should act as the employer of last resort and policy should promote small- to medium-size financial institutions, with a bias toward market segmentation. Senior Scholar L. Randall Wray explains today’s complex and fragile financial system, and how the seeds of crisis were sown by lax oversight, deregulation, and risky innovations such as securitization. He estimates that the combined losses throughout the entire financial sector could amount to several trillion dollars, and that the United States will feel the effects of the crisis for some time—perhaps a decade or more. Senior Scholar Jan Kregel reviews the basis of the historically high international trade and financial imbalances. He finds that traditional balance-of-payments adjustment theory does not apply to industrializing developing countries, and that we do not have a clear idea of the dimension of the problem. The important question is how to manage the imbalances and support the policies of developing countries so that they can integrate into the global trade and financial system. Volume 22 Issue 2 is now available online at informaworld ( http://www.informaworld.com ). Volume 15 Issue 1 is now available online at informaworld ( http://www.informaworld.com ). - A theory of socialism inoculated against Hayek? Board (journal@iipec.com) for clarifications or with any questions as they may arise. author should expect a prompt acknowledgment of receipt. may be made to the EPE editorial board if an exception to these limits is absolutely necessary. words) abstract, the JEL classification and Keywords. end of each page, and bibliography should be at the end of the paper. editorial board will consider the request as it is presented. - All Tables and Figures should be sent separately from the original document in Word or Excell format. indicated, and the author should clearly indicate where each table should be placed in the text. should clearly indicate where each figure should be placed in the text. Culture plays an important role in shaping the nature and content of economics. This fascinating book compares the two cultures of Japan and the United States and provides insights into the economic workings and differences between the two nations. This book is the first systematic study of how the interdependence of fiscal and monetary policies and the interaction of party governments and central banks affect the fiscal-policy mix in eighteen industrial democracies in America, Europe and Asia. Covering areas such as Jewish Studies, Economics of Religion, Sociology of Religion and Immigrant Religion, this book is required reading for all those interested in how economic environment influences the practice of Judaism in the United States. Answering a range of questions and written by a rising star in feminist economics, this book provides explanations of the different kinds of feminism, the evolution of feminist thought and, the history and sources of utopias as a theoretical and/or literary tool. This impressive collection from leading distributional analysts provides an overview of a wide range of economic, statistical and sociological relationships. The resulting book deserves its place on the bookshelf of serious mathematical economists everywhere. The editors of this book bring together scholars from numerous disciplines, along with non-academics to address the question of economic representation from a variety of perspectives, ranging from the question of globalization to cultural economies. This book explores both the pros and cons of the multiplier from a strictly post-Keynesian - and Kaleckian - approach. 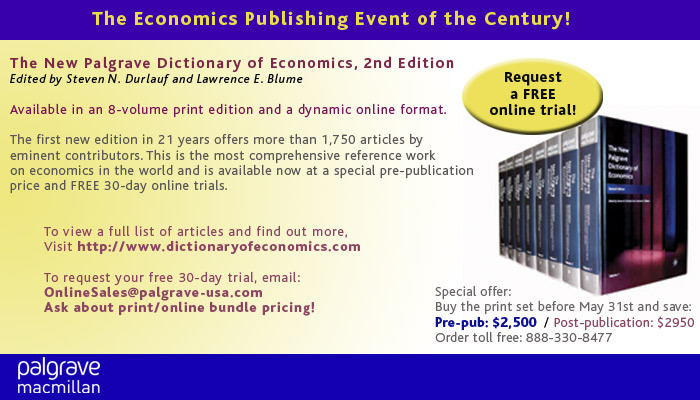 It offers a lively discussion from a number of well-known post-Keynesians from a variety of perspectives. Frank Hahn's powerful critiques of current economic methodology and innovative reconstructions of economic theorizing have long challenged the views of practising economists. This is the first book-length study of Hahn's methodological writings, and is essential reading for any scholar with an interest in the philosophy of economics. This collection examines the reflections developed exclusively in the Grundrisse to present an author in many ways radically different from the one presented by the dominant currents of twentieth century 'Marxism'. An interdisciplinary reader of scholarship relevant to feminist political economy, the selections in this book cover themes such as: feminism and the history of economic thought, and the feminization of poverty and welfare state policies. Corporate scandals due to bad accounting happen far too frequently for a system of corporate governance to be deemed effective. This book tells why the safeguards designed to prevent bad accounting so often fail. By studying why the auditors and members of a board of directors regularly fail to deliver the truth about a company's financial state of affairs, this provocative book explores a serious problem in the system of reporting financial information. This book is unique in that it draws together various strands of the literature on corporate governance, accounting, law, cognitive research, psychology, behavioural economics and conventional economics to shed light on questions regarding the feasibility of independence and impartiality of boards of directors and external auditors as monitors and gatekeepers in corporate governance. The book is essential reading for professional accountants and auditors, directors, regulators, law makers, corporate lawyers, and investment bankers. It will appeal to all those interested in behavioural economics and corporate governance. To find out more about this book, simply click here. In this impressive work, Lih presents an innovative challenge to the prevailing perspectives on one of Russian revolutionary V. I. Lenin's most important essays. While conventional wisdom has been contented to caricature What is to Be Done? as the definitive example of Lenin's authoritarian and elitist method, Lih traces this document's roots in the social and political debates of Russia's emerging socialist movement, and reinvigorates the debate unfolding today by introducing a comprehensive new translation of Lenin's original text. In the 1930s, Spanish workers and peasants captured the world's attention, bursting out in rebellion against poverty, oppression, and a monarchy frequently dependent on military repression for its survival. But the Spanish revolution quickly encountered critical challenges-from its leadership's confusion over their final goal to the rising of a fascist army led by Francisco Franco. In their unparalleled study, Broué and Témime detail the internal dynamics and the external obstacles that led one of the world's most promising movements for human liberation to fascist defeat. In the wake of a victorious worker's revolt in Russia, a revolutionary tide shook Europe, and in Germany, the worker's struggle appeared likely to succeed. In this magisterial work, first published in 1971 and still unsurpassed, Pierre Broué meticulously reconstitutes the six years during which-between "ultra-leftism" and "opportunism," "sectarianism" and "revisionism," "activism" and "passivity"-the German revolutionaries attempted to begin a new chapter in the history of the working class. Their defeat merits close attention, both for its role in the tragic direction in which German history proceeded, and for its lessons for Marxists and progressives today. In the 1840s, the young German journalist Karl Marx developed ideas about modern society that remain as relevant today as when they were first developed. Here, Löwy shows the lasting force of Marx's early writings on alienation and emancipation, and traces their genealogy among the intellectual currents of the day. By contextualizing Marx's unique reconciliation of materialism with dialectics among the intellectual debates and nascent workers struggles of the era, Löwy brings to life the founding ideas of one of the world's foremost social theorists. Drawing on Marxist theory and a critical history of international law from the sixteenth century to the present day, Miéville examines international legal norms and shows that they have always been complicit with the violence of empires. "Miéville's brilliantly original book is an indispensable guide for anyone concerned with international law. It is the most comprehensive scholarly account available of the central theoretical debates about the foundations of international law. It offers a guide for the lay reader into the central texts in the field and it mounts a formidable challenge to experts to address fundamental theoretical issues about the subject, which are too often simply ignored." Professor Takashi Yagi chairs the Group and he can be contacted at yagi@si.gunma-u.ac.jp. It is my great pleasure to announce the winners of the first John Kenneth Galbraith Prize in Economics: Mel Watkins and Kari Polanyi Levitt will share the Prize. The award was largely on the basis of their pioneering work around foreign (US) investment and ownership and multinational corporations back in the 1960s and 1970s. Both Kari and Mel will be in Vancouver for the CEA meetings and will co-deliver the JKG Lecture. We are still awaiting final confirmation of time slots but we anticipate that the event will be held on Sunday, June 8, in the final slot of the CEA conference (10:30 am). Please join us for this and our five other PEF panels this year. The JKG Prize will be awarded every two years and is based on a demonstrated contribution combining economic analysis with a commitment to social justice, and whose work exemplifies the goals and objectives of the PEF. In addition to Mel and Kari, the other nominees were Gideon Rosenbluth, John Loxley, Lars Osberg, Mark Setterfield and Marc Lavoie. Thanks to all who submitted nominations. The award was determined by a selection committee of Mario Seccareccia, Brenda Spotton Visano, Fletcher Barager, Andrew Jackson and Marc Lee. Submit an original essay (3,000 words maximum) by 1st July 2008 that addresses a current social research/policy question with critical use and interpretation of relevant data sources. Professor Danny Dorling, University of Sheffield, Dr Eileen Magnello, University College London, Dr Ben Goldacre, journalist and medical doctor. * Your submission must be unpublished & unaided original work: Either specifically produced for the competition, or originating from your course of study. critical use and interpretation of relevant data sources, or be a critique of statistical methodology in an applied context. one person, in which case any prize awarded would be shared. * Prizes will be awarded on the basis of readability, clear presentation of statistical material, critical perspective and convincing argument. Note: where a submission originates from course work, written consent of the tutor responsible will be required. The deadline for submission is 1st July and decisions will be made by 1st September 2008. Winning essays will be featured on the website and published in a special issue of Radical Statistics. RadStats Critical Essay, including full name, email and postal address, and institution at which you are studying or engaged in statistics, social research, or the social sciences to essay@radstats.org.uk. Most of us get our politics in our early 20s and then never change. Saul Bellow said of his youthful Trotskyism, “Like everyone else who invests in doctrines at a young age, I couldn’t give them up.” A young adult hates the bourgeoisie or loves capitalism or believes passionately in the welfare state. Her politics becomes a cherished identity, a faith. Here I stand. I can no other. The vintage matters. Someone who invested in doctrines when world capitalism seemed to be working just fine—on the eve of World War I, say—had a good chance of keeping for life an optimistic opinion of markets and entrepreneurs. So it was with one of the best-known economists of the last century, Joseph Alois Schumpeter (1883–1950) of Vienna, Bonn, and Harvard.